My grandfather Roscoe Doty (far right) was on the crew that built Pacific Highway through southern Oregon. This photo was taken in Phoenix. Jackson County was the first county in Oregon to have a paved road from border to border. 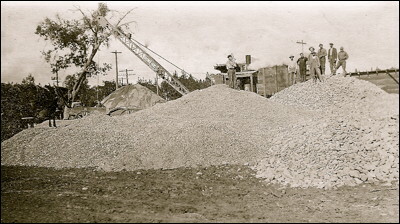 In 1923, the state of Oregon became the first state west of the Mississippi to have a border to border paved road. Then in 1926, the "Road of Three Nations" was completed, making it possible to drive from British Columbia to Mexico. At the time it was the longest paved road in the world, and it all started in Jackson County.